‘Hospital leaks patient records’, ‘Public transport smartcard has more holes than a sieve’, ‘Mobile banking app unsafe’ – it seems that everything can be hacked these days. Fortunately, the person who discovers a flaw is not necessarily a cybercriminal but is often someone who wants to help improve cyber security. He or she immediately contacts the system owner so that the problem can be solved. A well-coordinated approach allows everyone to learn from the exercise we call ‘responsible disclosure’. 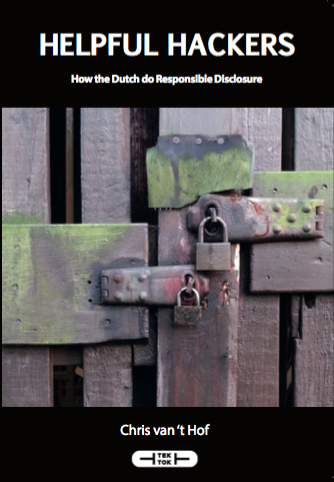 The Netherlands is a world leader in responsible disclosure. The Dutch like to resolve conflicts through a process of general consultation: the famous ‘polder model’. This seems a particularly appropriate approach in the realm of IT and cyber security, since there is no central authority with overall responsibility but many diverse players, each responsible for their own tiny part of a vast and complex system. In this book, we hear from the hackers, system owners, IT specialists, managers, journalists, politicians and lawyers who have been key players in a number of prominent disclosures. Their stories offer a glimpse into the mysterious world of cyber security, revealing how hackers can help us all.